Our product range includes a wide range of uv curing machine. We are offering UV Curing Systems Machine to our clients. 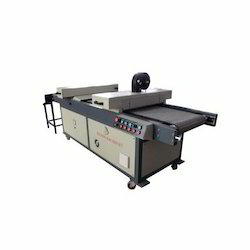 When UV Varnish or UV Ink printed sheet or object passes from UV it gets cured instantly. This system is compatibles for all types of coating lines, screen printing lines and offset printing lines.